Leadership comes naturally to some on the basketball court ,and Utah State fans are gradually starting to understand that Sam Merrill might just be one of those guys. The Bountiful native didn’t come to Logan with McDonald’s All-America accolades, and it wasn’t through speaking his mind that Merrill has emerged as a player teammates look for direction. 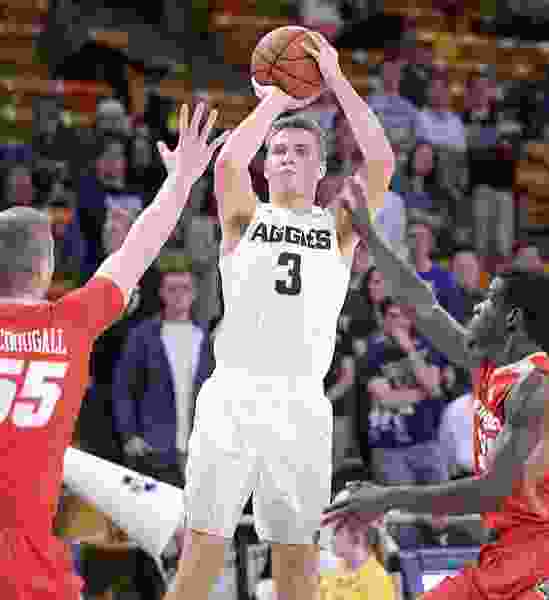 Only a sophomore for the Aggies, Merrill’s initial value was as a defensive player — one who could put the clamps on the opposition’s best perimeter scorer. But this season, when times have been tough for almost every Aggie when it comes to putting the ball in the hoop, Merrill has been the most consistent scorer on the squad and has kept the 12-11 Aggies from going into prolonged offensive slumps. “He’s really a servant-leader. I mean that is Sam Merrill to a tee,” Utah State coach Tim Duryea said. When • Wednesday, 7 p.m.
Merrill and fellow sophomore backcourt mate Koby McEwen were, entering the current campaign, the only two players returning for Utah State who averaged double-figure scoring. McEwen, though, was considered the most dynamic threat offensively for the Aggies. As for Merrill? “He’s really our defensive leader in terms of communication and helping teammates out and being our coach on the floor defensively,” said Duryea, who used him early in the season as a lock-down defender much in the same way Merrill was used as a freshman. As the season has progressed, with scoring from most of the Utah State players coming at an irregular rate and with even McEwen hampered early by a high-ankle sprain and occasionally struggling with his outside shot, it has been Merrill who has become an invaluable scoring asset. Utah State, 5-5 in Mountain West Conference play, has won its last two games and will host New Mexico Wednesday night at the Smith Spectrum. Averaging a team-leading 15.6 points a game, Merrill is shooting 51 percent from the field and 42 percent from the 3-point line. His 1-for-7 outing against Fresno State last Saturday was atypical. In USU’s previous game, against Air Force last week, he was 5-of-7 beyond the arc and 8-of-10 overall. “With Koby being hurt, missing four or five games there early in the year, I took it upon myself to be even more of a leader and take on more responsibility,” Merrill said. Merrill was the senior leader of the 2014 Bountiful team that won the Class 4A state championship — a team that included current college players Zac Seljaas (BYU) and Jeff Pollard (Washington State). After high school, Merrill went on an LDS church mission to Nicaragua. Once he got back, Merrill quickly went to work last year and got his first chance at starting for Utah State shortly into conference play during the 2016-17 season. And there he has stayed. The 6-foot-5 Merrill is bigger than might be assumed, which enables him to get shots off easier from the perimeter and make his way into the paint. Typical of a servant-leader, Merrill isn’t intent on being the Aggies’ scoring leader. When he’s handed the stat sheet right after the game, the first thing he looks for isl the opponent’s field goal percentage. “If I don’t score a point and we find a win because I’m making plays for others, that’s great,” Merrill said.